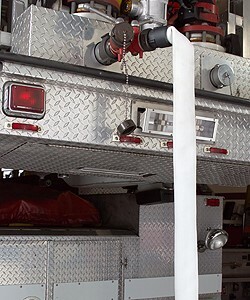 Our National Fire Hose 8D is a municipal grade double jacket hose with a lightweight EPDM rubber liner that meets all the requirements of NFPA 1961. 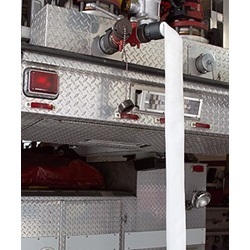 It is designed for use as an attack handline hose and is manufactured to a service test pressure of 400 psi to handle all fireground challenges with ease. Should one desire an upgraded design with similar materials using a rubber adhesive, UL or FM certification, or if a woven-in stripe is required for identification purposes, consider our Ponn Supreme hose. Exceptional quality, double jacket, rubber lined municipal fire hose made from 100% high tensile strength polyester yarn with a lining of extruded EPDM. Optional Dura-CoteTM treatment greatly increases abrasion, heat, flame and petrochemical resistance while virtually eliminating water pick-up. When treated, 8D is protected from mildew and no drying is required. Hose remains flexible to temperatures as low as -40°F (-40°C) and is highly resistant to ozone and oxidation. National Fire Hose 8D hose is manufactured in accordance with NFPA 1961 standard, latest edition within our ISO-9001: 2000 certified quality assurance system. Coupling Available: Aluminum NH/NST or IPT Threaded.